One of the benefits of Value Based Pricing is the customer pays what the result is worth to them. In a life-or-death case you could pretty much charge anything! So if you’re selling something that everyone else can sell (a commodity), then Value Based Pricing doesn’t work all that well. Your brand name has a lot of value. You’re the top person in your field. You’ve directly worked with the top person/company in your field. You sell your advice and you have an amazing track record in your field. …then you might be able to charge way more money. Value Based Pricing is where you charge a customer based on the value your services are to them. A major advantage of Value Based Pricing is you can charge customers way more money. If you’re selling a common item with a lot of competitors, Value Based Pricing will be hard. The painting is sold on its VALUE. Value is what the market will pay for it. 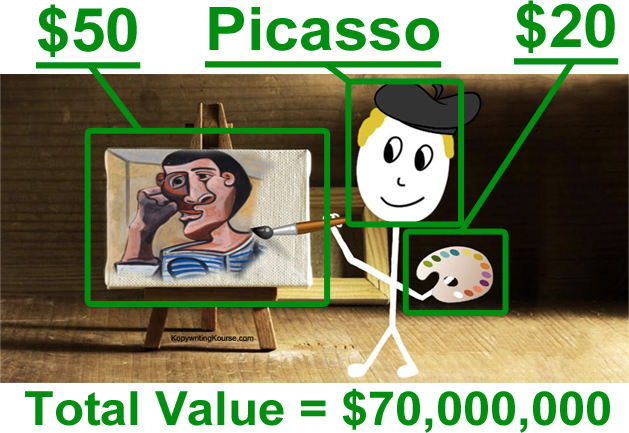 Added Value = Picasso was a famous artist. 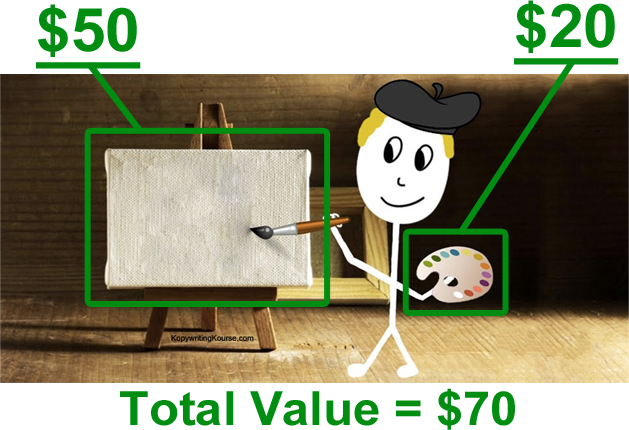 Added Value = Picasso is dead, so there will be no more Picasso’s made. Added Value = There is only one original painting like this making it rare. The raw materials of this painting are negligible, but there’s only ONE of these original paintings in the world, and a BUNCH of people want it, so the value shoots way up. To have the privilege of owning such a unique item, someone placed a value of $70,000,000 on that painting. $100/hr = Regular basketball coach. $250/hr = Coach that taught a famous basketball team. $100,000+/hr = LeBron James as your personal basketball coach. I couldn’t even graph that properly because LeBron James’ fee is so crazily higher. 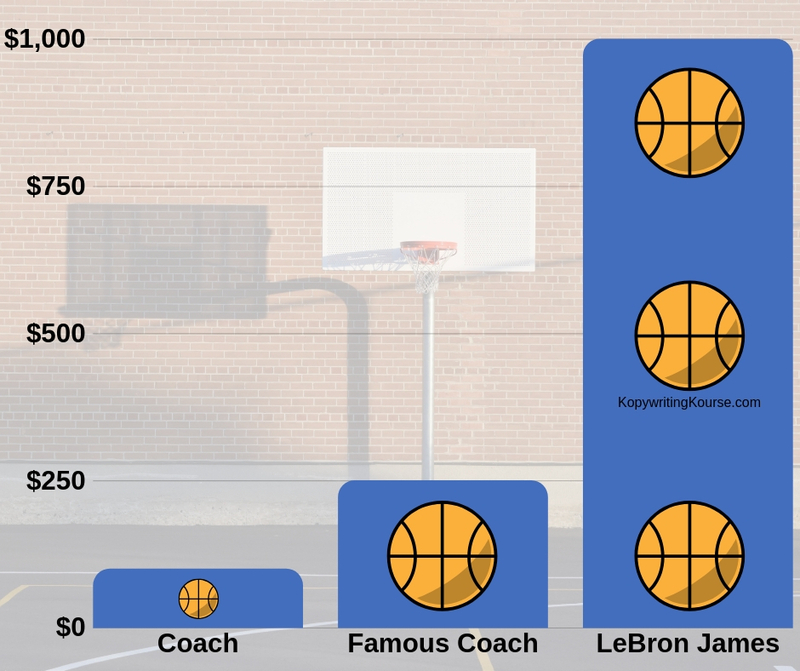 The normal Coach probably teaches the same thing, but the Famous Coach has more credibility, but LeBron James has an immensely large brand value which allows him to charge asymmetrically more than the others. He can charge more because he’s famous. He can charge more because he was an MVP. He can charge more because his time is high in demand. All of these things create added value to his time. Therefore he can charge on a Value Based Pricing model easier than the lesser known coaches. Instead of charging $50/hr for building landing pages, you might be able to charge much more. For example if your landing page will generate $100,000 in sales for your client, you might be able to fairly charge $5,000 or $10,000 for that landing page. You can can also use our Freelance Pricing Calculator to set your pricing better. I’ve created email templates for companies that have netted their sales teams more than $1,000,000 extra per month. Does that mean I should get $1,000,000 (or anywhere remotely near that sum) for my efforts? Those companies can find other copywriters help them. I’m not the only person in the world who can do this. For a lot of companies you can’t expect them to pay you how much they make from your services. This is the advantage your service or product has over others. Maybe your product is flat out better. Maybe the person in charge is a celebrity in the industry. This is the end value of the product to the customer. Maybe if you sell paid advertising services, your campaigns can make your customer $100,000/mo. What’s your product worth to the customer? 5% of its value is $50$50 per month or $50 per year$50 per year. 10% of its value is $50$50 per month or $50 per year$50 per year. 15% of its value is $50$50 per month or $50 per year$50 per year. 20% of its value is $50$50 per month or $50 per year$50 per year. 25% of its value is $50$50 per month or $50 per year$50 per year. 30% of its value is $50$50 per month or $50 per year$50 per year. 35% of its value is $50$50 per month or $50 per year$50 per year. 40% of its value is $50$50 per month or $50 per year$50 per year. 50% of its value is $50$50 per month or $50 per year$50 per year. 60% of its value is $50$50 per month or $50 per year$50 per year. 70% of its value is $50$50 per month or $50 per year$50 per year. 75% of its value is $50$50 per month or $50 per year$50 per year. 80% of its value is $50$50 per month or $50 per year$50 per year. 90% of its value is $50$50 per month or $50 per year$50 per year. 95% of its value is $50$50 per month or $50 per year$50 per year. 100% of its value is $50$50 per month or $50 per year$50 per year. Hopefully this taught you something about Value Based Pricing, and helps you decide what your product is potentially worth! If you like this, signup to our newsletter for more.